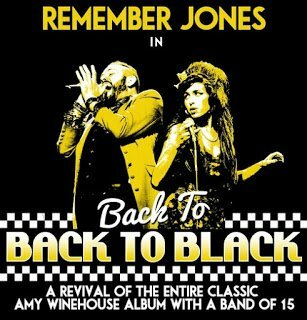 Amy Winehouse Tribute this weekend! This weekend’s lineup includes a tribute to Amy Winehouse, some Science on Screen, Inferno Pilates, Final Friday, Animation Show of Shows and your last chance to catch Ally Theatre’s excellent play, Rabbit Summer. Enjoy your weekend, Route One! Check out this great high-intensity, low impact, interval-training workout with awesome instructor Ty Powell. Curious? See my post here about classes at Joe’s & use code to try class for free! Dance Dance Party Party is a women-only freestyle exercise dance session! Come in your exercise clothes. Dance your heart out to an eclectic mix of music for an hour straight, make new friends, leave refreshed. This is an incredible form of exercise that you don’t even realize you’re doing. Join for the first of our Science on Screen series, featuring classic, cult, science fiction and nonfiction films provocatively matched with lively presentations by experts who discuss specific issues raised by each film. Dr. Eakin is the Chief Scientific Advisor for CHASING CORAL. Paint Branch Creek brings their blend of original Americana to Robert Harper Books one last time. Read my review of Paint Branch Creek here! Join us every Friday Morning for breakfast/coffee meet up with bike-minded folks. There’s plenty of bike (and car) parking in the Varsity building. Time/weather permitting we may take a ride after breakfast. Join SoHy Collective for another night of art and fun! Local artist Isak Shah will open her solo show “People Person” at Studio SoHy. Meet the artist and mingle with friends. Light refreshments will be served. Curious about Final Friday? Check out my post about it, here! Check out the last weekend of this fantastic show exploring legacy, gun rights and what it means to “live your truth” in an America built on lies and join for a post-show discussion with Meshaun Labrone, an 11 year law enforcement veteran. Read my review of Rabbit Summer here. Cost: Use code “LUCKYRABBIT” to get a $15 ticket! ICYMI: FREE CLASS to Get You Movin’ at Joe’s Movement Emporium! Join the Busboys and Poets Book Club @ Hyattsville for a four month look at the immigrant experience in the United States through four literary novels. On January 27, we discuss OPEN CITY by Teju Cole, as a Nigerian doctor working on his residency looks at national identity, race, freedom, loss, dislocation and surrender. Let’s try Bar Roubaix! This new DC restaurant/bar is bike-centric. They open at 10:30 on Saturdays, so it’s a perfect destination for this week’s Saturday social ride. Brett is leading. The ride is about 12 miles each way, and there is some riding on city streets, so it’s not a good beginner ride. Rethink the most visited rooms in your home with a backsplash install. Our Store Associates will cover trending and classic tile options, demonstrate how to prepare your surface and instruct you how to cut your project time down by mounting tiles with SimpleMat adhesive. Presenting 16 exceptional and inspiring animated shorts from around the world. At a time of increasing social instability and global anxiety about a range of issues, the works in this year’s show have a special resonance, presenting compelling ideas about our place in society and how we fit into the world. Make fancy, frilly Valentines at our all-day workshop! We’ll provide piles of vintage paper, ephemera, and trims, plus instructions for a few techniques you may not have tried before. Drop in for a few hours, or stay longer– it’s up to you. Either way, we provide all the materials and tools you’ll need. Come make Valentine Art with us! Use Ranger Alcohol Inks to create works of “HE-art.” Price includes one 3 pack of ink for you to use plus one stamper. We will provide refills and tiles for you to upcycle with style as well as instruction, tips and tricks to getting the look you want for your gift. Local collector and independent curator H. Elaine Jackson has, over a period of nearly four decades, acquired and exhibited work by prominent mid-20th-century artists of color drawn from the continental U.S., as well as practitioners from the Caribbean basin and Africa, with a deliberate focus on the graphic mediums. Tragicomedy examining the fracture point of a marriage and a friendship. An exploration – both tragic and comedic – of legacy, gun rights, secrets not well kept, and what it means to “live your truth” in an America built on lies. Mature audiences; explicit language/themes including gun violence. Read my review here! Cost: Use code “LUCKYRABBIT” for $15 tickets! Screening of ZER, a movie about Jan, a young man who traveled to Kurdish coreland to search for the truth behind a song his grandmother sang to him on her deathbed. Presented by American Kurdish Information Network (AKIN). There will be a Q&A with director Kazim Öz after the show! A four piece jam unit, playing classics from the Allmans, Hendrix, the Dead and more! Did you miss these posts? Check ’em out now! FREE CLASS! Get Movin’ at Joe’s Movement Emporium!